Pamper your skin for Spring! Enjoy your Subscriber Exclusive offer: 50% OFF 8 Skin Care Sets of your favourite products! 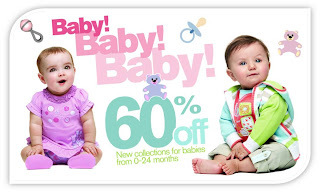 Save 60% Off Baby Clothes at Kricketsworld.com! Save 60% off Kricketsworld baby 0–24 month col­lec­tion. Ship­ping is free on orders over $125. Now shipping to the US as well! Get your FREE Lysol No Touch Hand Soap System! Lysol is giving away 2,500 no touch soap systems this week. Enter now by clicking on the "No-Touch" tab at the top of their facebook page. If you've already entered you're still eligible to win. One entry per household. Empire Theatres Peal & Reveal Event Is On! 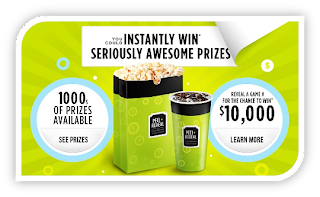 There are fabulous prizes to be won includ­ing foun­tain drinks, candy, gen­eral admis­sion tick­ets and even free movies for a year! Even a chance to win $10 000! Save $5.00 Off Polysporin! 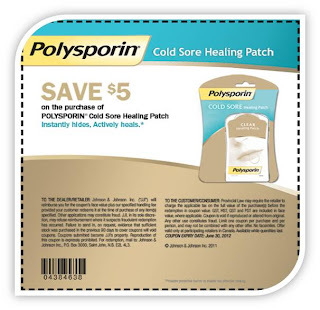 Printable Coupon! Buy 3 get the 4th FREE at Chapters/Indigo! This offer is in-store only until Sunday June 3/ 2012. 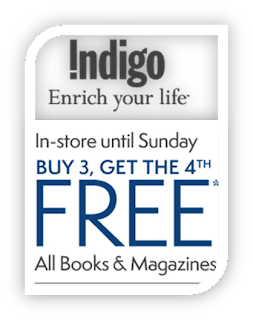 Offer does not apply to the purchase of eBooks, newspapers or Indigo Love of Reading fundraising book related products. Free book or magazine must be of equal or lesser value than the lowest priced qualifying item. Get a $10 Shoppers Gift Card When You Spend $50 or more! 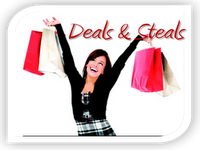 *Offer valid on the purchase total of $50 or more on eligible products after discounts and redemptions and before taxes. Excludes prescription purchases, products with codeine, tobacco products (where applicable), stamps, passport photos, lottery tickets, event tickets, transit tickets and passes, gift cards, prepaid phone cards, prepaid card products and Shoppers Home Health Care locations. 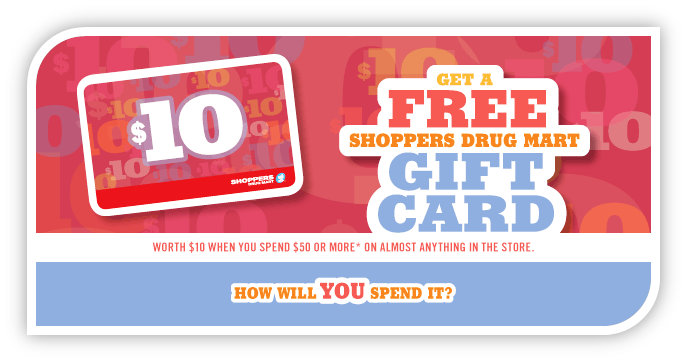 Not to be used in conjunction with any other Shoppers Drug Mart promotions or offers. Offer valid Monday, May 28 to Friday, June 1, 2012. While quantities last. Gift card cannot be redeemed for cash or credit and is valid on your next purchase of $10 or more. The gift card is a promotional card and expires on June 22, 2012. Gift cards are subject to terms and conditions on the back of the card. 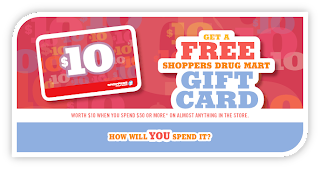 One Shoppers Drug Mart Gift card per transaction per customer. See cashier for details. 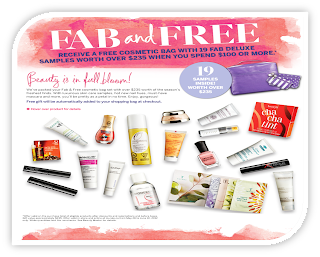 Murale free cosmetics bag filled with over $235 in deluxe beauty samples! Murale free cosmetics bag filled with over $235 in deluxe beauty samples when you spend $100 or more. This offer is running in stores and online today through June 10/2012. If you shop online, your gift will automatically be added to your cart at checkout. 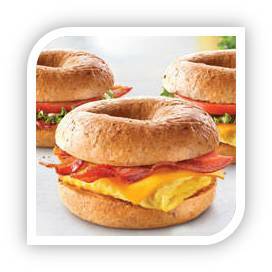 McDonald's 50% Off Bagel Sandwiches! This offer is running today through June 3 at participating McDonald's locations. 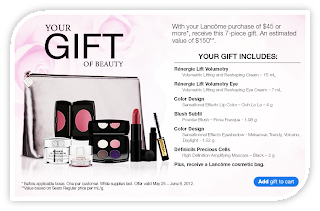 Sears Lancome Gift With Purchase! When you spend $45 or more on Lancome, you will receive a free 7-piece gift set worth $150!